To place an order we require a $50 deposit and to fill out a form. Once both are complete, we will start on your proofs! Get started here! Definitely! You can purchase a sample from our sample gallery. Interested in seeing different color options? Request up to 10 FREE swatches. Is there a minimum number of invitations I can order? We require a minimum order quantity of 50 invitations, as well as a minimum order amount of $250. Orders less than $250 will require a set up fee equal to the difference between $250 and the order amount. Yes! We are able to do invitations in any language. Please note that for doing split orders (more than one language), there will be an additional set-up fee. For languages other than English, we need the exact wording to be sent to us. Because we only speak English, you are 100% responsible for wording and proofreading. For more than one language, there is an additional $20 fee. Can I re-order invitations at a later date? Absolutely! We are happy to help with any additional invitations you need. A minimum of 10 invitations will be required for all re-orders. Any amount less than 10 will require an additional set-up fee. To avoid additional fees and delays, we recommend ordering 5-10 extra invitations in your initial order. No. Shipping is the clients responsibility. Please ask for a quote. Shipping prices are generally about $12-$20 for US shipping and $50 international shipping. How are my invitations shipped to me? We ship via USPS or FedEx, whichever is quickest and cheapest. Generally orders take 1-3 days to arrive once shipped. Invitations are between 1-2 oz and vary depending on the style chosen. Pockets will need a 2 oz. stamp. Should I have my invitations hand canceled/hand metered? Invitations that are hand canceled or hand metered will be hand sorted by the USPS rather than machine sorted. This will help ensure that your invitations arrive to your guests in the best possible condition. Our invitations do not require hand canceling, but you always have the option to do so. Additional fees from the USPS will apply. No, not unless upgraded. All product listed are listed with the liner as DIY pricing. Our liners are easy to assemble, and are the whole length of the envelope. Liner assembly is $0.50. For DIY assembly, we send you the printed invitation, and you mount the glitter/colored mat onto the pocket (if applicable). For the belly band, we send you glitter bands and a pre-cut medallion. Then, all you have to do is wrap the band and attach the medallion. Everything is printed and cut to size, just not glued together. We have products we suggest as well as some instructions if you decide to go the DIY route. Yes. Pockets, envelopes, belly bands, colored and glitter papers can be purchased individually in the supplies section. All products are printed on a laser printer. 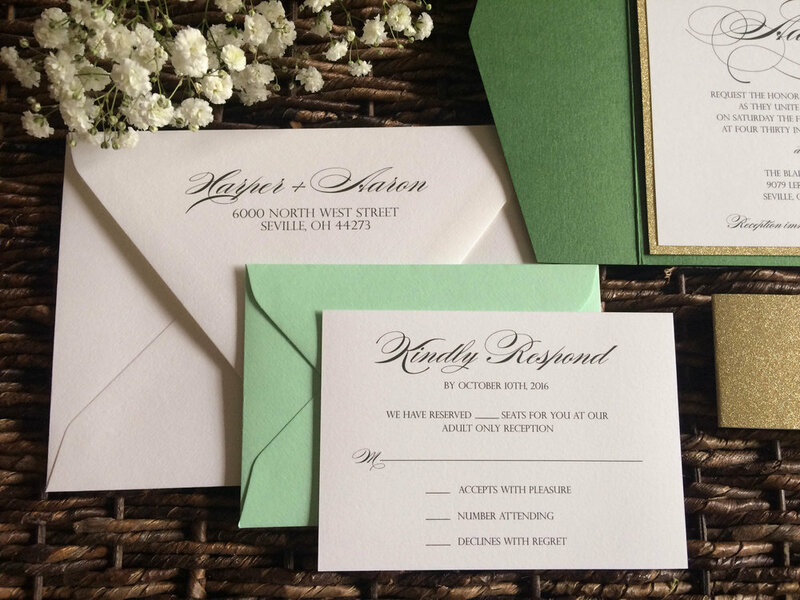 At this time we do not offer foiling or letterpress invitations. We do! The guest addressing is $0.85, and the return addressing is $0.35. When guest addressing, we can print the return address for FREE on the front. If you would like the return address on the back flap, it will cost $0.25. For addressing, we require that the guest addresses are sent in an Excel spreadsheet. We have a template we supply for this purpose. We do not recommend dark envelope colors as it can be hard to read the addresses. If you are having a calligrapher address your envelopes, please be sure to check their envelope liner policy as some require no envelope liners at the time of addressing. Can you print on two sides? We can print two sides on inserts only. Invitations cannot be printed on two sides because of the layers. Two sided printing is an additional $0.35 per insert/piece. We cannot print light colors on dark paper. We do not offer white ink printing. We know you may still have questions, and we are happy to answer them! Chat with us during business hours or shoot us an email at hello@czinvitations.com! Ready to start your order? We're ready to help!